Now a days I am preparing for CAT (stands for common admission test), which is to get into top B-schools in India. CAT requires a fair amount of vocabulary to be imbibed. And to learn new words there are different techniques. The one that is being practiced at my coaching center, MBA-guru, is audio-visual. 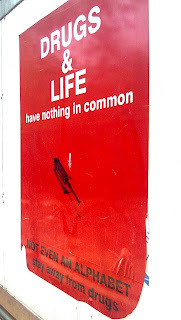 To remember the words 'Cadaver, Cadaverous', above picture, which I took near Connaught Place, can be of immense help. 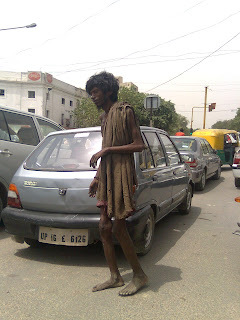 This guy along with a lady is the part of a begging duo or couple, who works as a team, near Palika metro station entry. His job is to lie down and demonstrate his cadaverous, gaunt, haggard, frame, upon which his team partner, the lady, begs. When I saw him walking, it was a sight worth mentioning as 'the death, reincarnated'. And all this just because of 'smack'. Why to get into such things? When it is capable of turning you into a cadaverous beggar. Choose life, Say NO to DRUGS.